Would You Buy This Rolls-Royce Phantom Shooting Brake Over The Cullinan? Another day, another high profile car reveal, and consequentially, another rendering pulled from the imagination of X-Tomi Design and represented visually with clever use of photo editing software. X-Tomi Design likes to take the newest models and render easily predictable follow-up versions, such as the BMW 8 Series Convertible, as well as more outlandish concepts that will never see the light of day, much like the Audi Q9 Crossover Coupe. This rendering fits into the latter category. Unless it’s commissioned as a high-cost one-off, Rolls-Royce has zero interest giving its newest Phantom the Shooting Brake treatment. In fact, the rear end of the Phantom is poorly suited to such a transformation. The classical roofline, highlighted by the abrupt drop off of the rear end, would make a wagonized Phantom look like and old Volvo V70 at best or a gaudy showboat with poor taste, the equivalent of Lady Gaga’s meat dress, at worst. And while we don’t have to worry about a suicide doored Phantom Shooting Brake coming to fruition, the fact of the matter is that this roofline may live on in an upcoming Roller, the Cullinan. There’s a few months left until the Cullinan’s 2018 release date, but spy shots of a camouflaged SUV have been released by Rolls-Royce or captured by our crafty photographers, all depicting the trapezoidal roof resting on top of a “high-sided vehicle.” It’ll resemble the Phantom both in DNA and by retaining its silhouette only with larger doors and taller sides. At the end of the day, the Cullinan, like this Phantom Shooting Brake, will only exist as a reflex to a changing market that places a greater emphasis on size, utility, and comfort even though the Phantom is already both large and comfortable and most Cullinan owners won’t stretch their luxury SUVs' legs past hopping over concrete blocks in the Hermes parking lot. 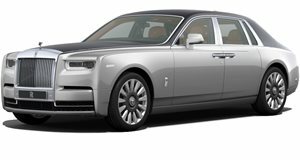 Given that the Phantom is Rolls-Royce’s brand ambassador, we can at least expect the Cullinan to preserve the same new face as this Phantom VIII to compliment the matching platform. We're currently living in a gilded age, and oh how good it is to be rich.